But that is the customer’s viewpoint. What then are the major concerns of the manufacturers? They need for production costs to be as low as possible, they want high dilution ratios, competitive price points, multiple “flavours” in order to occupy maximum shelf space in retail stores, and high profit margins. In other words, most shampoos on the market are not the highest quality. They’re not about what we want or need, but about what they want to sell us. So let’s go a little deeper. What’s in shampoo and what’s in a soap? What’s the difference? It all started about 5000 years ago when someone in Babylon made a soap-like substance from animal fat (or tallow) and kept it in a clay cylinder. It was surely an accidental discovery, one for which the entire world should be extremely grateful. Imagine being stuck in an elevator with a bunch of strangers who had never known soap. Well, humans are an inventive bunch, evidenced by the proliferation of soaps over the millennia: Castille soap (made with olive oil), floating soap (whipped full of air bubbles), glycerine soap, French-milled, scented, soap-on-a-rope, and so on. And then, more than 4000 years later, William Shepphard patented liquid soap in 1865. Liquid soap was introduced to the public consumer in 1980 by the Minnetonka Corporation. For years they had a lock on this market by buying up the entire supply of the plastic pumps needed for the liquid soap dispensers. A few years later the Colgate Palmolive company bought the liquid soap business from Minnetonka and a new industry was born. 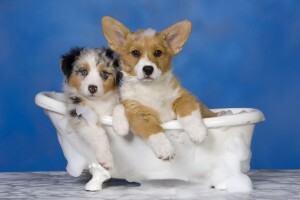 Liquid hand soap, liquid dishwasher detergents, liquid shampoos, liquid cleaners of all kinds, and the market exploded, including products for shampooing and conditioning our dogs, cats and horses. There’s a soap for everything… and if you don’t believe me, just visit www.soap.com. What’s in liquid soap? Here’s a typical example from a major manufacturer: Water, Ammonium C12-15 Pareth Sulfate, Magnesium Isododecylbenzenesulfonate, Lauramidopropylamine Oxide, SD Alcohol 3-A, Sodium Xylenesulfonate, Sodium Chloride, Fragrance, Pentasodium Pentetate, DMDM Hydantoin, Sodium Bisulfite, D&C Orange No. 4 (active ingredients: Triclosan 0.12%). Doesn’t reading this make you want to smear it all over yourself? Scary. So, what’s the difference between liquid soap and liquid shampoo? You be the judge. Here is an ingredients panel for a popular shampoo manufactured by this same major company: Water, Ammonium Lauryl Sulfate, Ammonium Laureth Sulfate, Sodium Chloride, Cocamide MEA, Glycol Distearate, Dimethicone, Fragrance, Panthenol, Panthenyl Ethyl Ether, Cetyl Alcohol, Polyquaternium-10, Sodium Citrate, Sodium Benzoate, Ammonium Xylenesulfonate, Disodium EDTA, PEG-7M, Citric Acid, Methylchloroisothiazolinone, Methylisothiazolinone. Well, what about the ingredients in good, old-fashioned bar soap? Here’s one of the top-rated soaps: Saponified Coconut and Palm oils, Sage Extract, Rosemary Extract, Ascorbyl Palmitate, Lemongrass Oil. Bearing in mind that most commercial bar soaps contain many ingredients that no one would consider “natural,” good-quality soaps are simple, containing just a few ingredients, most of which are instantly recognizable. IIf you’re going to put stuff on or in your pet, you should feel obligated to understand what those things are and what they do. We’ll make sure you have all the information you need to make an informed decision about the care of your fur kids. Until then, keep it clean, folks! Tags: Dogs Shampoo, Dogs Soap, Natural Dog Shampoo, Natural Soap for Dogs, Shampoo Bars for Dogs, Shampoo or Shampoo Bars to Bathe your dog? | Category: Dermagic UK, Dog Shampoo Liquid and Bars, SLS and Paraben Free, Why use natural shampoos?